This is a first year rosemary plant (my five year old bush died in the winter ) and is presently outside. I noticed these yellow and black areas on some lower leaves. What is it and what can I do? Rosemarinus officinalis is a perennial herb that likes a warm, sunny spot and well drained soil. They are sensitive to transplanting and can take time to settle in a new location. Rosemary is resistant to most diseases and pests and does not usually require fertilizers. From your picture I can not tell what location you have your plant in. Is the area in full sun and does the soil drain well? Is it in a pot or in the garden? 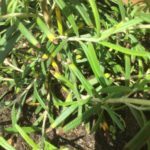 Rosemary is a drought tolerant plant that is used to growing in hot dry locations. With the wet weather we have had is it possible the plant is getting too much water? Too much water leads to yellowing then browning of the leaves and will ultimately lead to root rot. Another possibility is that it is struggling a bit from being transplanted. The best you can do is ensure you have the plant in full sun and monitor the dampness of the soil. The soil should have a chance to dry out between waterings. Giving the plant the growing conditions it thrives in should allow it to recover and grow.